By now, the $75 million America’s Finest should be deep into its first winter harvest season, catching and processing yellowfin sole and other fish in the Bering Sea. 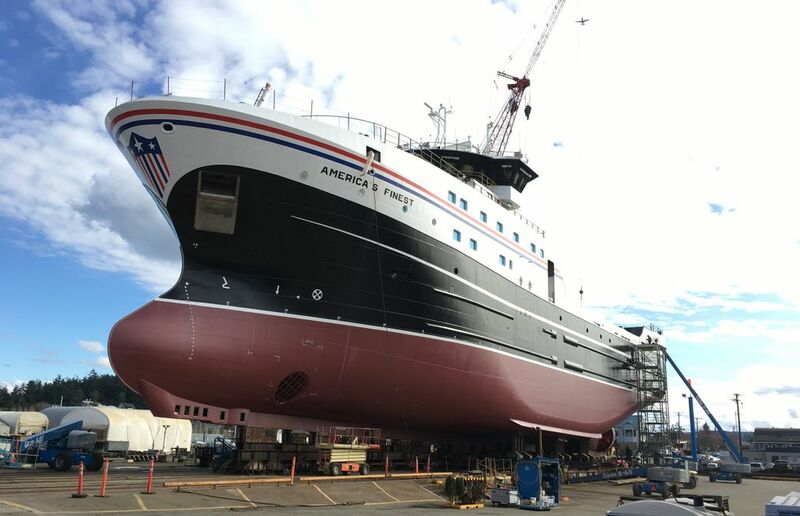 Instead, the 264-foot vessel — the largest trawler built in the Pacific Northwest in recent decades — is still unfinished. It sits moored at a dock at Dakota Creek Industries in Anacortes, and the shipyard has laid off more than 130 employees. The problem is a federal law that does not allow the ship to work in U.S. waters because the hull has too much steel modified in foreign shipyards. Asking Congress to override that ban has thrust the vessel owner, Kirkland-based Fishermen’s Finest, into a tough political fight with some of its Pacific Northwest competitors. Fishermen’s Finest wants the Washington and Alaska congressional delegations to back a straightforward waiver to the century-old Jones Act, which requires vessels transporting cargo and people between U.S. ports to have a hull largely made of American materials. But other seafood companies, along with political allies in Alaska are wary of the company’s expansion plans, and want any waiver to be accompanied by limits on how many fish it can catch and process in its North Pacific operations. They would “ensure that no direct or indirect competitive advantage will arise from the granting of the waiver” says a memo submitted to Senate staff by the Seattle-based Pacific Seafood Processors Association, which represents shore-based plants. Glenn Reed, executive director of the shoreside association, disagrees. He said the proposal is intended to lay out equitable guidelines for future operations. “If they are under the impression that we’re trying to sink the company — they are misinformed,” Reed said. The association members include Seattle-based Trident Foods — one of the largest seafood companies in North America — which last year paid their lobbyist to work on this issue, according to a congressional disclosure report. Trident will only support a waiver if it “doesn’t hurt our operations in cod and harm coastal communities where we operate,” said Joe Plesha, Trident’s chief legal officer. Trident and other shoreside companies depend on smaller trawl vessels to net fish and carry their catch back to the coastal processing plants. In recent years, however, some of these boats have started to deliver cod — a valuable species currently in strong demand — to Fishermen’s Finest and other at-sea processors. Fishermen’s Finest faces other opposition, too. In a January 25 letter to Alaska’s congressional delegation, the mayor of Unalaska, an Aleutian Island hub of the fisheries, threw his support behind restrictions on Fishermen’s Finest. Offshore competitors also have weighed in. Seattle-based U.S. Seafoods, which operates a fleet of catcher-processor vessels off Alaska, last year hired a lobbyist whose duties included expressing outright opposition to a congressional waiver for America’s Finest, according to a disclosure report. For Fishermen’s Finest, the decision to build America’s Finest was a leap of faith in the company’s future off Alaska, which sustains North America’s largest seafood harvests. Fishermen’s Finest is owned by Helena Park, who got her start in the Alaska fisheries back in the 1980s working in joint ventures as U.S. catcher boats — in an initial phase of Americanization — worked with foreign processing vessels. Park’s company currently operates two aging vessels, part of a fleet that catches, processes and freezes bottom-dwellling fish off Alaska. In 2008, changes in federal harvest rules set the stage for new investments in safer, more efficient vessels, and company officials say that America’s Finest would be a big upgrade. The vessel was supposed to leave the Anacortes shipyard by November. The delays caused by the Jones Act violation have taken a financial toll on Dakota Creek, which over the past year has reduced its payroll from 330 to 195 employees. 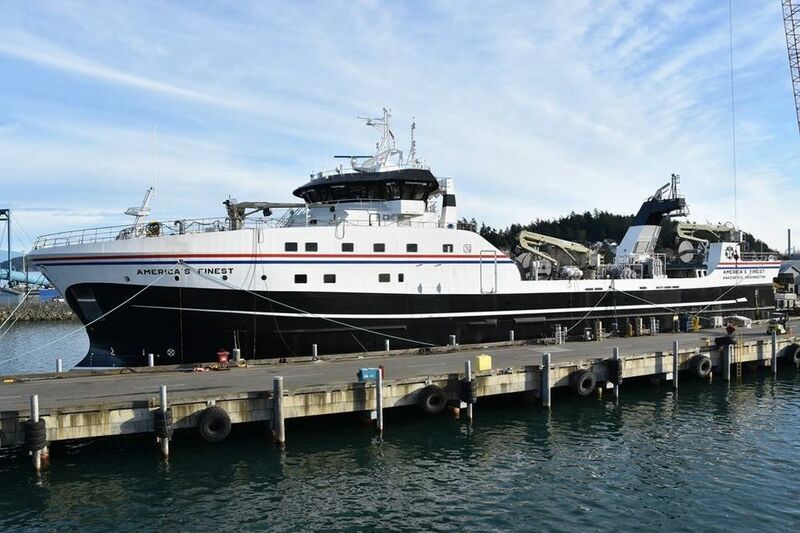 The shipyard is now focused on repairs, and a contract to deliver three small ferries to California that ends in December 2019, according to a Dakota Creek official. Dakota Creek ran into trouble with the Jones Act because the shipyard had some parts cut and bent in Holland. Due to that work, about 10 percent of the hull by weight is considered foreign — well above the 1.5 percent limit stipulated in the law, according to a brief prepared last summer by Jon Waldron, a maritime lawyer hired by the shipyard to seek the waiver. Fishermen’s Finest so far has paid $62 million of the estimated $75 million cost of the vessel. Waldron argued that failure to get a waiver could result in financial repercussions “so draconian” that neither the shipyard nor Fishermen’s Finest would survive. Sen. Maria Cantwell, D-Wash., hopes to attach a Jones Act waiver for the ship to a Coast Guard reauthorization bill that has cleared the Senate Commerce, Science and Transportation Committee. Bryan Watt, a Cantwell spokesman, said the senator is concerned about the economic damage to the shipyard, which is a significant employer in the Anacortes area and an important resource for the state’s maritime industry. “We are solely focused on the shipyard, which the senator has visited. Not the peripheral issues,” Watt said. But the Coast Guard reauthorization bill typically moves through the full Senate through unanimous consent, so any senator who has disagreements can prevent its progress. Shoreside processors are hoping that Sen. Dan Sullivan, R-Alaska, will insist on making their proposal a prerequisite for any vessel waiver for Fishermen’s Finest that is inserted into the bill. They argue that Fishermen’s Finest should accept the restriction, and take delivery of the vessel so the shipyard is not in peril. The dispute between the shoreside plants and offshore operators also has been brought up in the North Pacific Fishery Management Council, a regional group that is charged by Congress with setting harvest rules. Moran says that allocation issues — who can take delivery of which fish — should be resolved by the council, not Congress. Reed, representing the shoreside processors, says he would agree to having congressional restrictions put in place for a five-year period, then sunset. That, he say, would give the slow-moving council a chance to act. Given the gridlock that has stalled so much legislation, it is hard to say when Congress will act on the waiver. Meanwhile, at the shipyard, America’s Finest still needs to have sea trials and other system checks completed. Currently, no work is being done.